The 1911 field is admittedly crowded, but there are few names more recognizable in that crowd than Remington. We all knew it would happen. When Remington announced it was going to be making the R1, a semi-retro version of the historic 1911, a "modern" version from Big Green couldn't be too far away. Well, it has now arrived. The Remington R1 Enhanced Model has most of the features America's gun buyers want on their modernized 1911s. I say most because I dare you to find two 1911 fans who can agree on which sights, options and accessories make the modern combat/carry 1911. The R1 Enhanced sports an Ed Brown-style beavertail safety and single-side thumb safety. The gun also has very functional flat-bottomed slide serrations. This is still an all-steel, 100 percent made in the USA pistol with a businesslike matte black finish. I'm glad to see Remington didn't just slap on some sights and a beavertail to its original R1 and call it a day. The company apparently put some thought into what gun buyers would be looking for. First, the rear of the frame has been machined to accept an Ed Brown-style beavertail grip safety, which is a huge improvement over the original GI design in both operation and comfort. The grip safety has a raised pad at the base to help ensure deactivation by people with small or thin hands. That raised pad is checkered 20 lpi and matches the checkered flat mainspring housing. The short trigger has been replaced with a long one adjustable for overtravel and the spur hammer with a skeletonized Commander-style one. The R1 Enhanced has the same Series 80-style internal firing-pin safety as the original R1. This safety has a well-deserved reputation for screwing up trigger pulls, but I didn't experience that when testing the original R1. I did experience it, however, with my Enhanced sample, which had a crunchy five-pound trigger pull. Remington advertises trigger pulls between 3.5 and five pounds. The pistol I received for testing looked a bit like a war relic, with patches of bluing gone and a bit of rust on the slide serrations. I learned the sample had just survived an event at Gunsite. Perhaps clean and new the Enhanced model I shot would've had a better trigger pulls, but it certainly ran without a problem--digesting every type of ammunition, including Black Hills' new steel-cased .45 ACP offering. Both the flat mainspring housing and the raised pad at the base of the grip safety are checkered 20 lpi for sure handling. The magazine well features the same bevel as on the original R1, but the frontstrap has been vertically serrated. The pistol comes with dark brown, checkered, laminate wood grips. 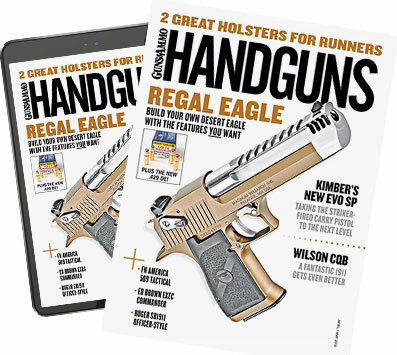 They were on the thick side for 1911 grips and relieved on the left side for easier access to the magazine release. The magazine release is what I've come to see as a standard-length part in the industry, but it is longer than the one on the original R1. The Enhanced model has an extended, single-side combat thumb safety that had positive clicks up and down. The R1 Enhanced features a no-snag, Novak-type rear sight adjustable for elevation. Both front and rear sights are in dovetails. The front sight is a long, robust post with a red fiber-optic insert. The insert is supported at the front, back, and twice in the middle by steel, and is one of the more robust fiber-optic sights I've seen. The Enhanced has dropped the GI-style angled slide serrations in favor wider, flat-bottomed serrations. Flat-bottomed serrations are much more aggressive, and thus more functional, especially if your hands are sweaty. Remington engineers also added front cocking serrations. Some people don't like front cocking serrations--as much for aesthetic reasons as anything else-- but I use them and was glad to see them on this pistol. Slide-to-frame fit was very good; barrel fit was even better. The R1 has a stainless steel barrel bushing and the standard GI recoil spring/plug system. It is provided with two eight-round magazines with base pads. The pistol's fiber-optic sight is one of the most robust of this type the author's seen. The Enhanced also features front slide serrations. The owner's manual advises against the use of +P ammunition in the gun, but I don't consider that an issue. It's a .45, the handgun cartridge against which all others are judged when it comes to stopping power. I wouldn't want to get hit with a thrown 230-grain full metal jacket bullet, much less one traveling 850 fps. The 1911 field is admittedly crowded, but there are few names more recognizable in that crowd than Remington. If its combination of features seems right for you, check one out. Smallest Avg. Group: 230-gr. Hornady FMJ...1.8 in. Largest Avg. Group: (tie) Remington 185-gr./185-gr. Black Hills Steel Case JHPâ€¦2.3 in. Accuracy results are the averages of four five-shot groups at 25 yards.